Do you like digging through your checking account statements every month? If your answer is yes, either you’re a numbers freak, or you’re just plain crazy! Let’s face it, no one, myself included, in their right mind likes digging through checking account statements every month. Aside from the fact that it is just blatantly and utterly boring, looking at those small lines of text and numbers can give you a headache. It takes forever. Ohh, and did I mention, IT’S BORING? OK, so by now, you’ve got a good idea of how much I enjoy going through my bank statements. Just in case you didn’t catch it…I hate it! Unfortunately, like most people, if I absolutely hate doing something that I know should be done, I generally forget about it. Well, at least until I have no choice but to deal with it. Well, I’ve finally come to the point where I have absolutely no choice. The other day, I logged into my online banking and got one of those “WHAT, WHAT, WHAT” moments. Before logging in, like most people, I had a good idea of how much money I had sitting there. I knew how much money I brought in, how much was already there, and I had what I thought to be a good idea of how much money I spent since the last time I checked. Here’s the kicker. When it comes to the “good idea of how much money I spent since the last time I checked”, I wasn’t just off, I was way off! I’m talking over $300 off, which is where the “WHAT, WHAT, WHAT” moment came into play. When I logged into my account, I realized that I had $300 less than I had originally thought. What a kick to the groin! I like to think I’m pretty good about allocating money to bills, savings, spending, etc… This time of the year is a pretty big one for spending. Although I’m not going to get into what holiday I celebrate, I can say that I do celebrate one of them and it involves giving gifts to family and friends. Well, my gift giving budget for friends is around $250, for family it’s around $1,000 and for my fiance, it’s around $300. The only problem is, because of this mishap, the only way I’m coming up with the total of $1,550 for gift buying in time is to dip into my retirement account. That’s money that really shouldn’t be touched! In one of my reviews here, I went over Mint. When I did that, I should have signed up. If I had, chances are, this problem wouldn’t have come to fruition. However, I had completely forgotten about Mint. As a matter of fact, after this mishap, I was planning on sitting down with my statement in hand and a spreadsheet on my computer to get a good idea of where my money was going each month. Then, out of the blue, Jeremy sent me an email. In his email, he asked me about Mint and if I had signed up. Of course, I told him I hadn’t and answered what questions he had. Later in the conversation, he asked me to sign up and test it out. After doing so, I was to write a report that would be used in a collaboration post….shhhhhh it’s a secret! Anyway, once I signed up, one of the first things I noticed is that all I needed to do was attach my spending accounts and Mint would track my spending for me. SCORE! Now I don’t have to worry about that boring end of the month task of digging through my statement to find spending trends, and finally figure out where I was overspending. Mint does that for me! The entire point of me sharing all of this with you is so that you don’t have to experience the same thing I did. That being said, you’ve got a couple of options here. Either sit with a statement and a spreadsheet and track all of your spending. Or, do what I did. Sign up for Mint and let them do it for you! Do you track your monthly spending trends? If so, how do you do it? Are you using a program like Mint or going old school pen and pad for tracking your spending? I use a spreadsheet and log in to my bank account several times a week and record my spending from there. I don’t even get paper statements and as long as I keep up with recording my spending regularly, it doesn’t take up much of my time. Hey Kasey, thanks for swinging by. I’m glad it doesn’t take much of your time to go about it that way. That is a rough thing to find out this close to Christmas! I personally, to the dismay of my fiance, am a tracking machine. I make her bring me receipts of everything she spends so I can enter it into my Quicken! I’m also checking my online bank account frequently. Hopefully, you can find some other way to make up the $300 besides dipping into retirement. That’s never, ever, a good solution. That $300 will cost you thousands in earnings by the time your set to retire. Yea, it’s a real bummer. Luckily, I just landed a big deal that will net far more than the $300 I needed…sooooo excited! Thanks for swinging by Blake! I use mint, but I also check my spending every week on Thursday. We are living paycheck-to-paycheck now that we are down to one income so I try to stay on top of everything as it comes in. Hey Michelle, thanks for swinging by. Mint works great as long as you follow up with it. Sometimes the category thing can be a bit off. Anyway, sorry to hear you’re down to one income. I hope everything works out well for you. Thanks for your comment! Yea, I guess if you’re doing it every few days, it would only take a few minutes. Thanks for your comment dojo! Your moral was what I was going to suggest from the beginning. We have had mint for years, so we never have to actually touch the statements themselves. It’s nice to have everything all in one place. Manually entering can be good too, to help you really see what you are spending your money on (since you have to spend a couple of seconds to enter each transaction). I would definitely do it more frequently. I go into mint every couple of days to make sure mint categorizes things correctly and to split purchases. If I wait until the end of the month, all the walmart/target transactions mesh into one and I have no idea what was what. Any tool that helps with budgeting is always welcome! I love Mint! I use quicken to track my spending and budget as well as retirement, savings, mortgage and other loans. It is a lot of work to keep your books up to date but I find that it’s worth the work – I feel in control of my money and can avoid the surprises. Also, one tip is to track your expenses weekly so that you don’t have to go through all of them at the end of the month. I don’t mind going through my bank and credit card statement to see what I spent and where, but I also don’t do that much shopping or have many bills. I can see how that would get cumbersome after a while if you did. I enter all my spending into my budget spreadsheet. I’ve tried Mint, but I didn’t take to it for some reason. Glad you’re using it now! I have a very similar attitude when it came to tracking my spending. I hated the data entry required and thought it should be automated. Everything was already online on the bank statement, can’t they just parse it? Well, then I found Mint and I have been diligently tracking my accounts since. It takes care of the boring data entry part so I can have fun with data analysis. Something that is much more interesting. I’m using a cell phone application that tracks my expenses. I also love this application because it’s very easy to use. I’m old school- I like tracking with a good old fashioned spreadsheet. To be honest, I found Mint to be a little… annoying I guess. I hate being on my phone all of the time, and changing categorizations, and linking to my account was not something I was a fan of. So, I log on, write it down, and add it up by hand (while smoking a cigar, wearing one of those green visors, with a pair of suspenders and old adding machine). I tried mint, but honestly seeing all my student loan debt was giving me a heart attack. Now I’ve got that under control, but I use an excel spreadsheet and just track my expenses daily. It’s helped me so what my average is and where I’m consistently going over (food). I used to use mint but for whatever reason, there were always errors with my linked accounts. It seemed like every time I logged in, a different account wouldn’t update. I spent more time regaining access than I did tracking my spending. I’m not sure if it was just an issue I was having. When it did work though, it was really awesome. Pretty interesting article, hope it works as a good learning to many people including me too, who sometimes neglect their bank account statements or spending habits. Though it may not be an easier task to keep every expenditure in mind that is why many software’s have arrived in the market to help in tracking expenditures & account details. I truly feel its a very good move to keep a track of financial database without indulging too much into it. I don’t use Mint.com anymore. I used to, but they messed up tracking my accounts several times. This was a few years ago, so maybe they don’t mess up as much as they used to, but I went to using Fidelity’s Full View, which uses Yodlee, which was a precursor to mint.com. Fidelity recently updated Full View and that messed it up. I have gone back to just looking at my account statements online and consolidating them by hand. It only takes a few minutes each month. I always track down my expenses and consolidate it at the end of the month. I also analyze which ones should I cut down in order to increase my savings. The whole family is try to live as frugal life as possible. I always track down my spending’s. I dont use any third party help like mint. I love to make calculations and manage my account in my way. But yes, sometimes some expenses comes as a shock when reviewed later. LOL! I’m tracking my spending with the use of just a notebook and a pen. I could say that it has a positive effect on me, because I know where my allowance goes and if I’m spending too much on unnecessary stuff. It’s so easy to spend more than the budget you allocated for, especially during the holiday season. Mint seems like a great online tool to help you keep track of your spending and rein you in whenever you go over your specific budget. I’d love to track spending through mint, but my wife’s income has involved cash tips and I haven’t been able to convince her to deposit to our checking and use cards… a work in progress I guess. I actually stopped tracking my expenses 2 years ago. It is indeed necessary to track everything we spend. I’m kinda old school so I’ll use a spreadsheet. Thanks for the information and the helpful comments. 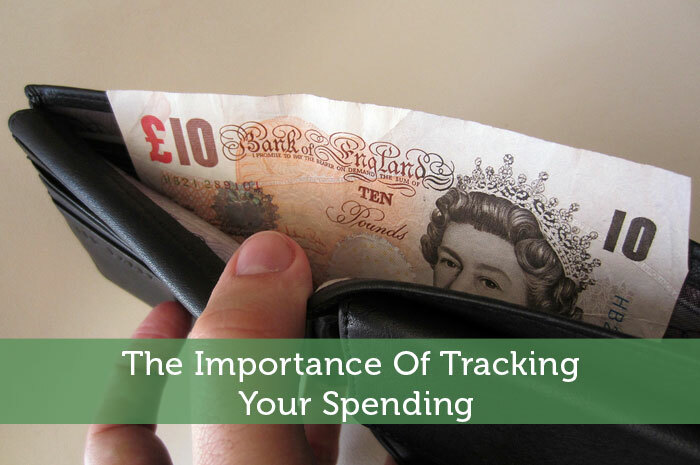 I believe in the importance of tracking spending. I basically do it the old fashioned way, but with a modern twist. I keep notes on spending on my iPad. I’m crazy and I do both! I use Google spreadsheets to track my spending by each transaction. Then I also use Mint to see what all my accounts look like. It helps a lot since I’m married and we’re trying to reach certain goals together.